Is Peterborough Museum in Cambridgeshire haunted? 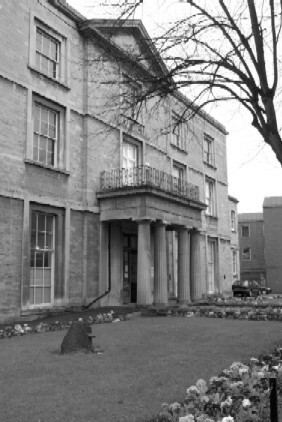 The building was first built in 1816 for the magistrate Thomas Cooke and his wife and was used as a courtroom for a short while, before becoming Peterborough Infirmary from 1857 - 1928. The building even survived a nasty fire in 1884 well enough to house injured World War 1 troops, before becoming a museum in 1931. The oldest parts of the building are the cellars which date back to around 1538, although it's not known for sure what they were used for. The most frequently witnessed ghost is of Australian World War 1 solder Thomas Hunter, who sadly died in the infirmary in 1916. He's known as the grey ghost, so called because of his grey clothes and suitcase. His ghostly form has been felt and seen numerous times walking up & down the first floor stairs along with an overwhelming sense of unease. Spiritual Mediums have discovered that this sense of unease is created by the spirits on strong emotional feelings of being trapped in a foreign building and wanting to return home - an impossibility for Thomas Hunter. On the upper floors, in a room that used to be an operating theatre, a young woman and a little girl are often seen. Mostly seen in corner-of-the-eye fashion dark shapes, they often create poltergeist activity and an uncomfortable feeling and they like to move glass objects.